June 3, 2015 Sakae Toiyama of Ryukyu Shimpo reports from Washington D.C.
On June 2, Okinawa Governor Takeshi Onaga met with members of the U.S. Senate and House of representatives to ask for a review of the plan to build a new U.S. base in Henoko, Nago, to replace Marine Corps Air Station Futenma in Ginowan. The governor first met with the U.S. Senator John McCain (Republican), the U.S. Senate Armed Services Committee Chairman, and Jack Reed (Democratic), chairman and ranking member of the U.S. Senate Committee on Armed Services. McCain is a former presidential candidate and an influential political leader, particularly regarding U.S. defense policy. 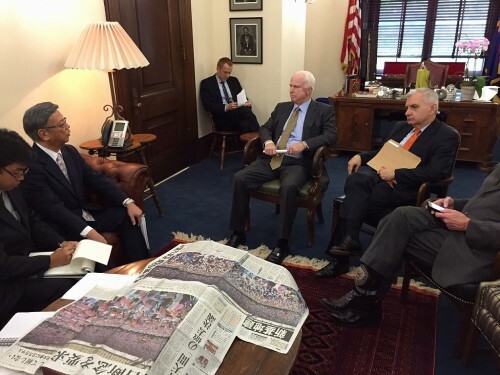 McCain and Onaga met for one hour, during which they were split over the Henoko plan. However, they agreed to continue dialogue on the issue. The Governor showed the senator reports in the local newspapers, including the Ryukyu Shimpo, of a protest rally, aimed at blocking the new U.S. base in Henoko, attended by 35,000 people, which was held in May. “I am encouraged by the people’s support. The will of the people has been clearly illustrated on this issue,” Onaga said. He stressed how strong his stance was against the Henoko plan. McCain said that he was aware of the feelings of Okinawan people, and he agreed to continue dialogue in the future.